1. Consultation: During the initial phase of treatment planning for an implant, 3D imaging may be the first step necessary in order to obtain the proper diagnostics to determine candidacy and safety. We will work with you to explore all your treatment options and formulate a plan that will meet your oral health goals. 2. Extraction: The next step is to remove the unhealthy tooth. 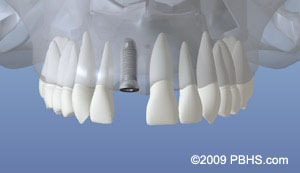 If the right conditions exist, an immediate implant can be placed at the time of extraction. However, most often, bone grafting will be required prior to implant placement. 3. Bone Grafting: It is fairly common for the jawbone to lack the volume needed to accept an implant. In this case, a bone graft will be performed first to rebuild the target area. Bone grafting is typically followed by several months of healing before the implant can be placed. 4. Surgical Guide Fabrication: Using advanced cone beam computed tomography (3D Xray) combined with an intraoral scan, we will create a custom prosthesis that will fit over your teeth and gums that include indicators for where to precisely place the dental implant for a long term predictable, functional, and esthetic outcome. 5. 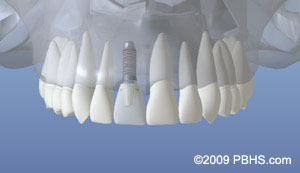 Dental Implant Placement: A medical grade titanium screw will be inserted into the jawbone. You will be anesthetized and completely comfortable for the entire duration of the procedure. 6. Osseointegration: After placement of the dental implant, this is healing phase that allows the bone to fuse to the implant and anchor it in place. This typically takes anywhere between 3 to 6 months. When this process is complete, the implant is put through a variety of tests to ensure it has successfully fused to the bone. 7. Implant Restoration: After osseointegration is complete, your general dentist will attach the final crown restoration. The procedure to place a dental implant takes approximately 60 minutes for one implant and only 2 to 3 hours for multiple implants. The number of appointments and time required, vary from patient to patient. The surgeon will bring great precision and attention to the details of your case.